First named Border, due to its proximity to Louisiana, it is thought to have been established sometime in the 1840s. It maintained its own post office until 1849 when the town was renamed after William Jones - the community's first storekeeper. A nearby community named Concord merged with Jonesville - losing its post office and identity in the process. In 1884 the town had 60 people and by 1892 it had grown to nearly 300. The community declined to 150 by 1933. By 1950 it was down to 100 and declined further to the present figure above. 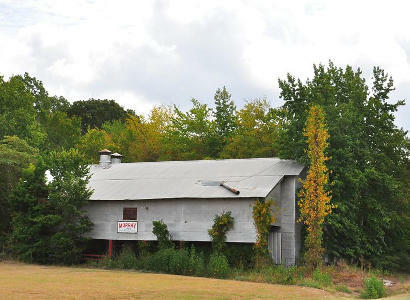 "From Scottsville, continue on 1998 until you reach the intersection of Farm Road 134. 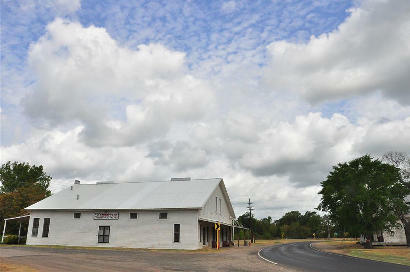 Head south on 134 to the one-time cotton community of Jonesville. Here, you'll find an honest-go-goodness general store of the kind found around the turn of the century. The T.C. 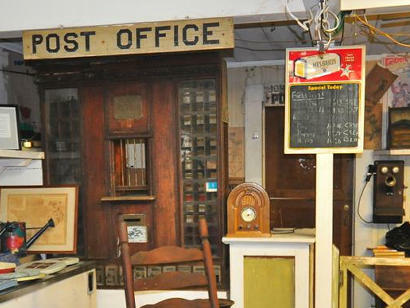 Lindsey & Company General Store, which evolved from the Jones Trading Post, has been in business since l847 and includes an enormous antique collection, as well as run-of-the mill store items. The store has been the scene of several movie and television productions. Nearby is a new museum housing rare automobiles, jukeboxes, and other memorabilia. 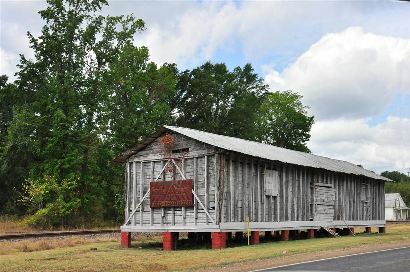 You'll also find at Jonesville a cotton gin, one of the last such businesses left in East Texas; the home of Dr. Samuel Floyd Vaughn, which dates back to the l840s; and Locust Grove, a stunning two-story house with double porches built in l847. Same named towns are not equal. 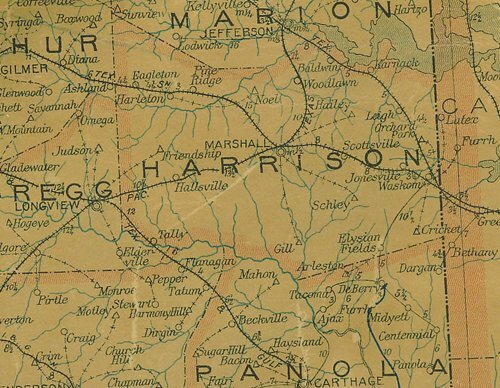 "Just letting you know the Jonesville, Texas (1847) of Harrison County in northeast Texas is just a few miles north of I-20 and Highway 80..about mid-way between Marshall and Shreveport LA. 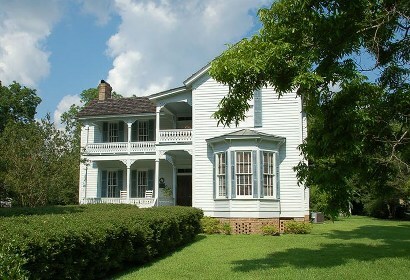 [This] Jonesville is home of the Dr. Samuel Floyd Vaughan home (a Texas Historic Site), and Locust Grove antebellum home along Coleman Road. The pre-Cival War Swanson's Landing to Marshall Southern railway extended through Jonesville. When the railway was taken up during the Civil War, the track was relocated to connect Marshall with Shreveport. Union Pacific now manages that railroad through the current town of Jonesville. We are having to fight to keep our Jonesville Texas Post Office 75659 open...partially because of confusions and incorrect locations listed by Google Map and other sites that have confused our HARRISON County Jonesville with the Angelina County ghost town with the same name. 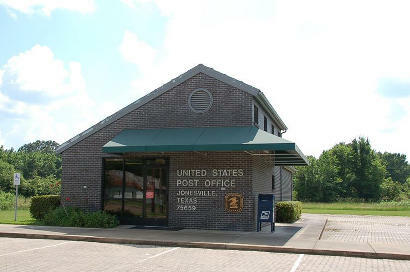 Buy stamps from 75659 Jonesville to help keep our U. S. Post Office open." A key port on Caddo Lake for traffic to New Orleans, 1830s-1860s. Founded by Peter Swanson (1789-1849), a civil engineer and planter. 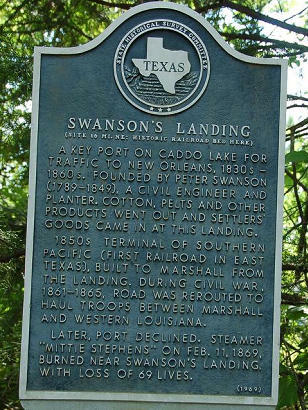 Cotton, pelts and other products went out and settlers' goods came in at this landing. 1850s terminal of Southern Pacific (first railroad in East Texas), built to Marshall from the landing. During Civil War, 1861-65, road was rerouted to haul troops between Marshall and western Louisiana. Later, port declined. Steamer "Mittie Stephens" on Feb. 11, 1869, burned near Swanson's Landing with loss of 69 lives. This home evolved from a two-room central hall plan house built in 1841-42. The second story was completed in 1865, and the Italianate style front rooms and Eastlake style porches were added after Dr. Samuel Floyd Vaughan purchased the home in 1870. 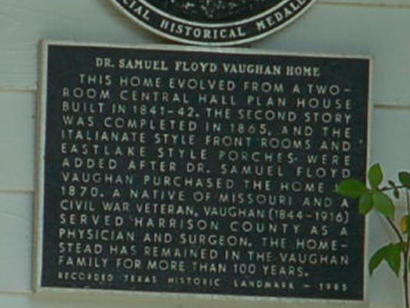 A native of Missouri and a Civil War veteran, Vaughan (1844-1916) served Harrison County as a physician and surgeon. 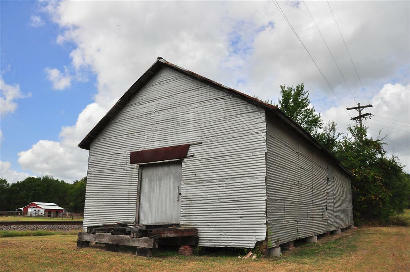 The homestead has remained in the Vaughan family for more than 100 years.